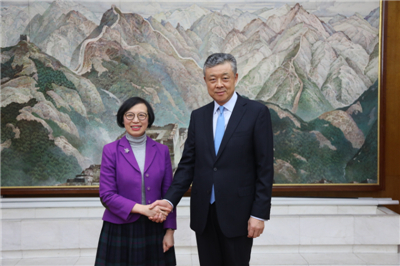 On January 9, Ambassador Liu Xiaoming met with Professor Chan Siu-chee JP, the visiting Secretary for Food and Health of Hong Kong SAR Government, at the Chinese Embassy. Ambassador Liu noted that China-UK relationship is currently developing steadily with deepening pragmatic cooperation in various fields and ever-closer people-to-people and cultural exchanges and international collaboration between the two countries. The exchanges and cooperation on health care have increasingly become a highlight of the two countries. Last September, the fourth China-UK Health Dialogue was successfully held, which signifies a broad prospect of cooperation on medicine, genetic research and other fields between the two countries. The Ambassador stressed that over the past 20 years since its return, Hong Kong has won worldwide recognition for its remarkable achievements. Not long ago, President Xi Jinping and Premier Li Keqiang met with Carrie Lam Cheng Yuet-ngor, the Chief Executive of Hong Kong SAR Government respectively during her duty trip to Beijing and fully affirmed the work of the Chief Executive and Hong Kong SAR government. Ambassador Liu expressed the hope that Hong Kong would seize the opportunity of the new round of China’s reform and opening up, leverage the platform of building the Guangdong-Hong Kong-Macao Big Bay Area and the Belt and Road Initiative, and actively integrate its own development into the overall development of the country for new achievements. He hoped that Hong Kong, as a bridge and a bond for China-UK relations, would continue to make full use of its strengths to help with China-UK cooperation in various fields including the exchange on health care. Secretary Chan briefed the Ambassador on the health care cooperation between Hong Kong and the mainland, and between Hong Kong and the UK, saying that with the strong backing of the motherland, Hong Kong would give full play to its own strengths in language and location and seize the opportunities brought by the Guangdong-Hong Kong-Macao Big Bay Area and the Belt and Road Initiative to further carry out cooperation with health care institutions in the Mainland to promote Chinese medicine and cope with population aging. 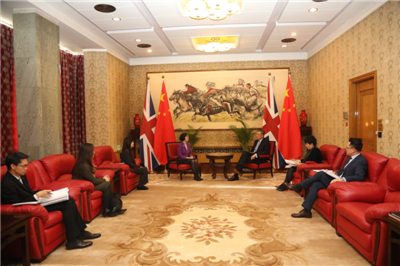 Hong Kong would actively expand cooperation with the UK in genetic research and basic medical service so as to make contribution to the development of the motherland and China-UK cooperation.